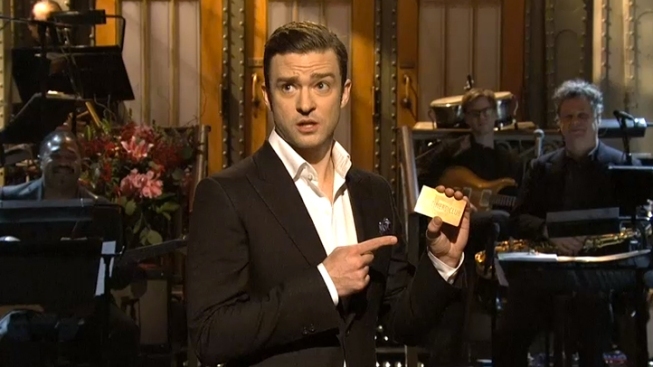 Justin Timberlake holds up his "Five Timers Club" card. If "Saturday Night Live's" musical guest and host this week Justin Timberlake didn't enjoy his time on the show, he's an even better actor than anyone knows. Timberlake and his mega-watt smile reprised old roles and added a few new characters to his catalog, including a dancing vegan restaurant mascot and a bailiff on a Maine court show. "SNL" began with C-Span coverage of Hugo Chavez's "funeral." After a short eulogy by acting Venezuelan President Nicolas Maduro (Fred Armensen), Elton John (Timberlake) continued the services by singing a new version of "Candle in the Wind." His version referenced some of the former president's much publicized comments like calling George W. Bush "the devil" and having once said capitalism may have killed life on Mars. "Goodbye Hugo C," Sir Elton sang. "You had great style and panache; you were a man of the people and you liked to wear a sash. You called George Bush the devil when you spoke at the U.N. You said he smelt like sulfur. And you called him Mr. Danger. And it seems to me, you lived your life, like a candle in the wind. If a candle could pull out two pistols, during a press conference." The show was star-studded. "SNL" original Dan Akroyd was in the opening monologue, as well as Steve Martin, (Akroyd and Martin also appeared in another sketch reprising their "Two Wild and Crazy Guys" routine) Chevy Chase, Candice Bergen, Tom Hanks, Martin Short, Alec Baldwin and singer Paul Simon. A joining of the "Five Timers Club," for people who have hosted "SNL" five times or more, Timberlake too was inducted into the legendary group, but was a bit confused as to why Akroyd was merely a bartender there. "He was an original cast member," he said. "Surely that means something, right?" Martin was quick to tell Timberlake the way things work in the club. "You're adorable," Martin said sarcastically, with a chuckle. Martin then gave Akroyd the last dollar bill in his pocket for a tip. The rest of his wallet contained only 100 dollar bills, he said. Another former "SNL" star, Andy Samberg, who left the show in 2010, also appeared in a few sketches. Weekend Update with Seth Meyers, like the opening sketch, touched on the death of Venezuelan President Hugo Chavez. "Leaders from around the world, including Mahmoud Ahmadinejad and Cuba's Raul Castro on Friday attended the funeral," Meyers said. "On an island, I'm guessing, that was shaped like a skull." On Friday Kentucky Republican Rand Paul's near 13-hour Senate filibuster garnered headlines as one of the longest in history. Meyers felt Rand deserved some respect for his rant, one where Rand reportedly said the word "drone" over 200 times. "I applaud Rand Paul for taking a stand for his beliefs," Meyers said. "I've only talked for 13 hours straight once in my life. And my girlfriend still broke up with me." With the conclave nearing, the Vatican should have a new pope sometime soon. NBC News reported on Saturday that no conclave has lasted for more than five days. That's not fast enough for Meyers. "Go ahead, take your time," he said. "It's not like you're all 80." During his musical segments, Timberlake performed his new single, "Suit & Tie," which featured rap legend Jay-Z, and "Mirrors."